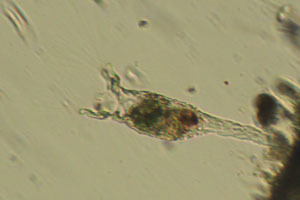 Gnathifera occur in water, sediments, and as parasites of other animals. 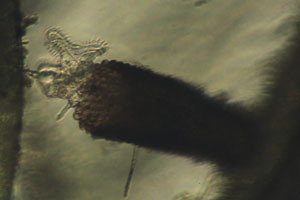 Free-living kinds have characteristic jaws in the throat, and most are less than 1 mm long, using cilia to move or collect food. 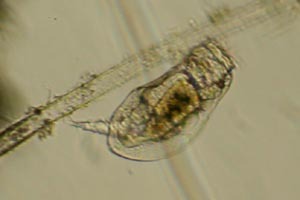 Rotifers are by far the most common of these, including all but a few kinds from marine sands. 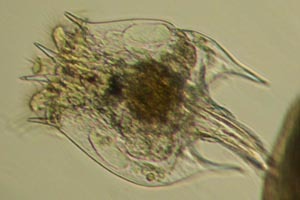 The cilia in rotifers form a corona or crown around the mouth, which ranges from a simple field to complex lobes and bristles. In most the body has a posterior foot, which usually has two or more toes and adhesive glands, used to form temporary or permanent attachments. 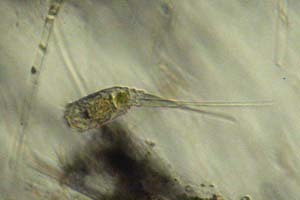 Some also have sensory antennae and simple eyes. 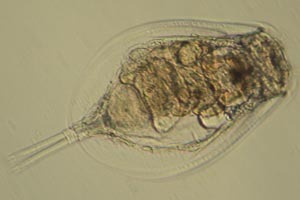 Reproduction takes place by laying eggs or sometimes live birth. Most individuals are female and parthenogenetic, i.e. have offspring without mating. Normally males are smaller and reduced, and only occur under certain conditions, so are rarely encountered. Bdelloids are exclusively female with paired ovaries. They are worm-like and contractile, and variously move by swimming or by alternately stepping with their head and foot. Most have a retractable corona divided into two parts, which look like spinning wheels when active, and two spurs just above the toes. Adineta have an oval head with a neck but no wheels. They move by sliding the head along, collecting food with a rake and cilia underneath, instead of the usual steps. Rotaria mostly have two eyes on a forward projection, called the rostrum, and a dorsal antenna with none. They are usually long, some extremely so, with prominent spurs. 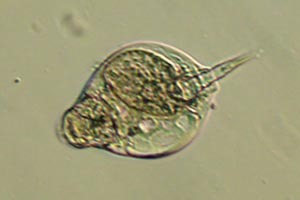 In monogononts females have a single ovary. They come in a great variety of forms, divided into two main groups. 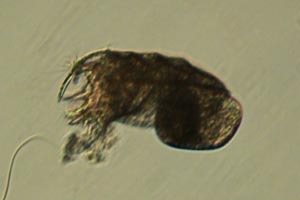 Gnesiotrocha usually have a long foot with no toes, though it is occasionally lost, and many live attached or in colonies. Most have a lobed corona and their jaws are adapted for pounding or cutting. Latin testudo, turtle, -ella, dimn. 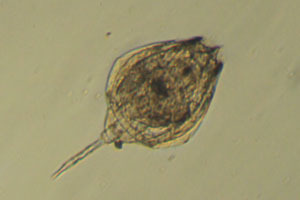 Testudinella are flat and nearly circular in outline, except for the head, which has two lobes and can be retracted. 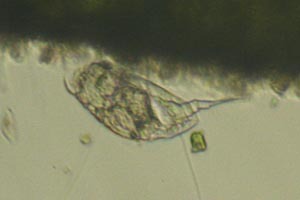 There is a small ventral foot with cilia, remaining unattached. 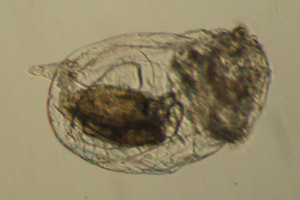 Ptygura have a nearly circular or oval corona without lobes. 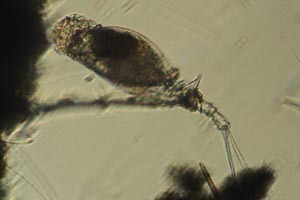 They usually live in gelatinous cases, in some covered with debris, found most often on aquatic plants and algae. Latin flos, flower, -culus, dimn. Floscularia have a corona with four lobes. Some live in gelatinous tubes but most make them from collected material, rolled into pellets and placed into a regular array. 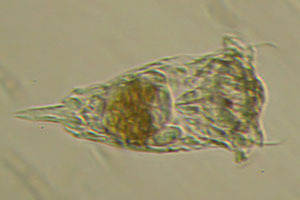 Limnias are sessile with a corona divided into two ciliate lobes. They live inside hardened tubes of secreted material, variously smooth or with sculpted rings. 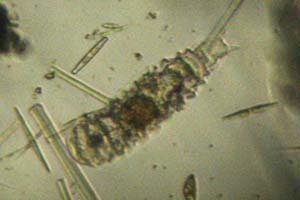 Collotheca have several knobs or flaps around the mouth, covered in long fine setae which close inward to trap prey. Most are again sessile with clear gelatinous tubes. 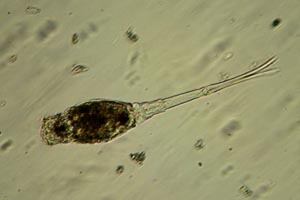 Ploima are typically free-swimming rotifers that have either two toes, rarely reduced to one, or sometimes no foot. The jaws are variously adapted for grinding, sucking, or sometimes gripping prey, and in many kinds the cuticle is hardened to form a protective lorica of one or more plates. Latin squatina, shark, -ella, dimn. Squatinella are easily recognized by their large head shield, which looks like a halo from above. They have deep bodies with a long foot and often spines. 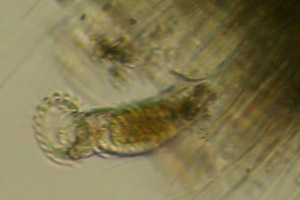 Colurella are flattened side-to-side with a ventral notch for the foot. The lorica forms a small shield over the head, with a hook that helps them stir up food. Lepadella also have a ventral notch for the foot, but the lorica is flattened top-to-bottom. The foot itself has 3-4 marked rings, short toes, and serves as a flexible attachment while feeding. 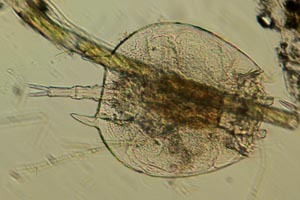 Taphrocampa are slender and flexible, with a dorsal eye near the front and short toes at the posterior. The body is divided into marked rings by a series of distinctive grooves. Notommata resemble the above but lack the grooves. 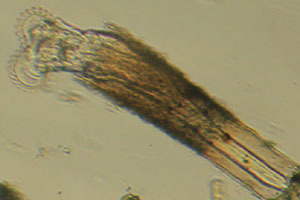 They are similar to several other genera, but a few species may be recognized by a spine-like tail from between the toes. Monommata are another kind with one eye and no lorica. The toes are well-developed, with the left normally slightly shorter than the right, but both longer than the body. Trichocerca have a cylindrical lorica, often with short spines at the front or ridges. The foot is reduced with mismatched toes, in many kinds with one very long and one very short. 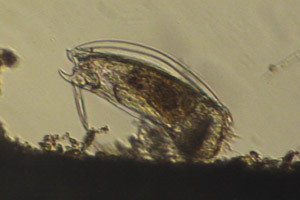 Euchlanis have their lorica separated into a larger dorsal and flat ventral plate. The former curves over the base of the foot, which has 2-3 weakly marked rings and two toes. Lecane have their foot reduced to a flexible base with one or two style-like toes. The lorica is also flattened and separated into dorsal and ventral plates. 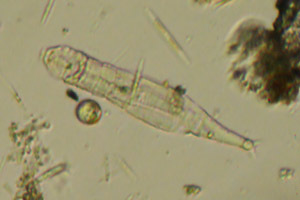 Trichotria have a thick lorica with ridges on either side. Their foot and toes are long, with a characteristic pair of spines where they meet the body. Platyias have a flattened lorica with short spines on the front and rear margins. The foot has marked segments and toes, and is attached under the body. Brachionus have a flexible foot without marked segments. 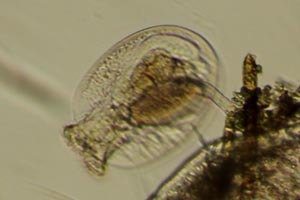 The body is flattened with marginal spines, but unlike Platyias has an eye and sometimes carries external eggs. Notholca have six short anterior spines and sometimes a pointed tail, but no foot, toes, or carried eggs. The lorica is flattened and typically has lengthwise furrows or a keel. 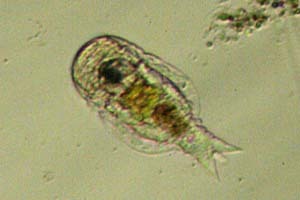 Keratella also have no foot or toes, but the lorica is divided into several facets rather than striated. They often have attached eggs and some have one or two posterior spines. Lophocharis have an oval to rhombus-shaped lorica with a thin raised crest along the back. The foot emerges behind the end, with 3 marked rings and short toes. Mytilina have a lorica with a dorsal furrow. The front and rear margins often have spines and cover the base of the foot, which is typically short with pointed toes. Greek skaros, leaping, -idion, dimn. 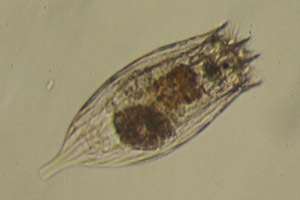 Scaridium are long rotifers with a thin cylindrical lorica. The foot and toes are each about the same length as the body, and can act as a spring for sudden movement. 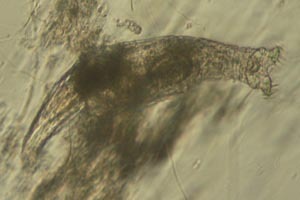 Asplanchnopus are sack-like rotifers that eat other animals, using their jaws to seize and swallow them whole. 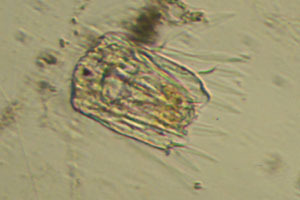 The body is hollow and contractile, with a small foot on its underside. Polyarthra are set apart by blade-shaped appendages in four groups around the front, used in a rapid jumping motion. There is no foot but some carry attached eggs. 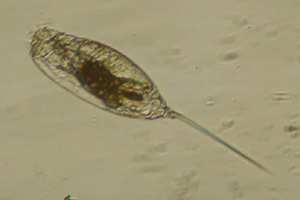 Synchaeta have a more or less conical body ending in a short foot and toes. 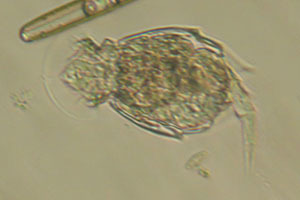 The head has a ciliated projection on either side, with four spines and one eye between them.